Afer a suitable period of mourning for Grumpty, Mojito and Zorro, I've become the owner of two new dwarf hamsters, Roborovskis to be precise. They're still quite small and are unnamed as of yet. Roborovskis are noted for being much more active than the other breeds of dwarf hamster, and I've already noticed that my new little dudes are clocking up the miles on the wheel. They're also quite adept little climbers. As a result I feel that I have to buy some additional tubes and climbing stuff to keep them occupied. 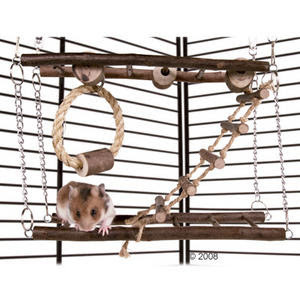 Hence the hamster suspension bridge available for purchase on eBay. The other thought that's currently brewing in my head is a little project to measure exactly how far the hamsters run over the course of a night. A little bicycle computer should do the job, but at 54cm in diameter, the hamster wheel is at the small end of what bicycle computers are typically designed for. I'm still searching for a suitable non-contact revolution counter.